Molting is a necessary but stressful process for a fiddler crab, as it takes significant energy and puts him at risk to predators or tank mates. Knowing the signs of molting can help you respond correctly to a molt, giving your fiddler the space he needs and the calcium supplements that will help him develop a new hardened carapace. Fiddler crabs have a hard exoskeleton. While this protects them from predators and the elements, it also restricts their growth. When fiddler crabs grow too large for their current shell, they will molt and form a new larger one, giving them the space to expand. Fiddlers can also use a molt to get rid of harmful toxins, which concentrate in the chitin, or regrow lost limbs. Two to three days before your crab begins to molt, he will go through some slight color changes, taking on a more brown, light brown or purplish hue. Researchers believe this is due to the beginning separation of the new cuticle from the old exoskeleton, and may include partial reabsorption of the minerals, such as calcium, in the old shell. In the wild, fiddler crabs need to be cautious during a molt, since they are highly vulnerable to predators. 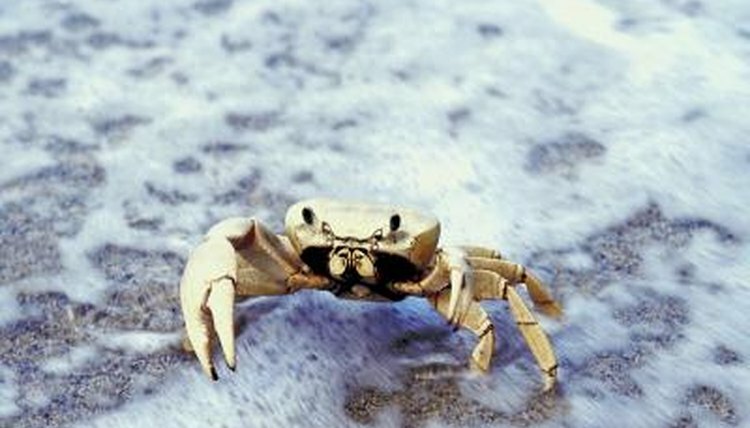 A few days before molting, your crab may become less active, find a place to hide and stop feeding. Several hours before your crab is about to shed his shell, he will become very still. This is normal, healthy behavior, and you should not move or try to touch your crab during this time. If your fiddler has any aggressive tank mates, even other fiddlers he formerly got along with, you may want to move them until his new shell fully hardens. The average fiddler crab will molt around every eight weeks, although younger crabs may molt more often due to faster growth rates. The epidermis will begin separating from the cuticle about 10 days before your crab sheds his exoskeleton. The actual shedding process only takes around 15 minutes for most crabs, while the hardening of the new shell can take several days. Your crab will need plenty of water and calcium, which may include him eating his old shell, to fully recover from his molt. Once the new shell is fully hardened, your fiddler crab should return to his normal activity level.